James Comey testified that he withheld information from Attorney General Jeff Sessions about his meeting with Donald Trump. 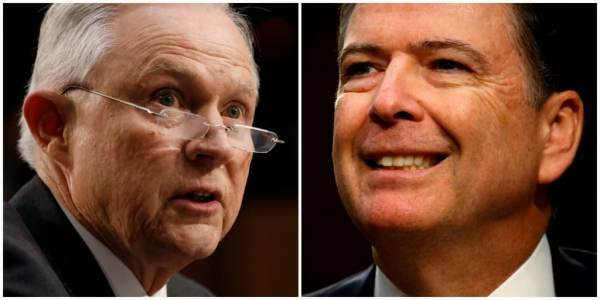 Comey and the Obama Deep State engineered Sessions’s recusal! President Trump had no idea AG Jeff Sessions was going to recuse himself from the Russia investigation and matters involving Hillary Clinton, but the FBI knew. Jeff Sessions cited the wrong law when he recused himself from his job on March 2nd, 2017. Deputy Attorney General Rod Rosenstein subsequently took over the Justice Department – Rosenstein then appointed Robert Mueller as special counsel to harass and imprison President Trump and members of his 2016 campaign. Mr. Jordan. Why did you decide not to share it with the leadership of the Justice Department? Mr. Jordan. Excuse me one second. I’ve got to move. I’m having trouble seeing you here. Mr. Comey. We believed that the Attorney General, Mr. Sessions, was on the cusp of recusing himself from anything related to Russia, so it didn’t make any sense to brief him on it, and that there was no Deputy Attorney General at that point. Mr. Jordan. Why would you make that assumption? I mean, just because — I mean, first of all, if he was on the cusp of leaving, that’s a judgment call. Maybe he was; maybe — I can’t recall exactly what was going on in February. But he’s still the Attorney General. He had not recused himself. If this is something important enough for you to memorialize, talk to your top people, why not then share it with the top law enforcement official in the government? Mr. Comey. Because we believed — it turns out correctly — that he was about to step out of any involvement, anything related to Russia. Mr. Jordan. I understand that. But just because you believe he’s about to do something doesn’t change the fact that he’s the Attorney General and, frankly, as the Attorney General for our government, should receive that kind of information, I would think. Mr. Meadows. So how did you know that he was on the cusp, according to your words, the cusp of recusal? How would you know that? Mr. Comey. A couple of reasons. It seemed like an obvious case for recusal, given his role in the campaign. And I think — in fact, I know we had been told by that point that the career officials at the Department of Justice were recommending that he recuse himself. I think we knew that at that point. So it seemed a foregone conclusion the Attorney General was going to step out of Russia matters. Mr. Meadows. So who told you? Mr. Comey. I don’t remember. Mr. Meadows. Why would they have told you? Mr. Comey. Well, the person who told me would have been someone on my senior team. Mr. Meadows. Yeah, but why would that have been communicated? Before a recusal actually took place, why would they be communicating that to you, Director Comey? Mr. Comey. Why would my staff be telling me? Mr. Meadows. No. Why would someone at the Department of Justice tell you that Jeff Sessions is going to recuse himself that would actually change your actions and what you decided to do? Mr. Comey. First of all, I know I said this before, but no one told me from the Department of Justice. If your question is, why would someone at the Department of Justice tell someone at the FBI, that I don’t know. Mr. Meadows. So who told you? I mean, obviously, it changed your decision. So you’re saying that you have no knowledge of who told you that Jeff Sessions was on the cusp of recusal? Mr. Meadows. That’s your testimony? Mr. Meadows. Well, it obviously did because you didn’t take it to the Attorney General, which is the highest law enforcement officer. You didn’t take it to him. So your testimony just now suggested that it did change your actions. Mr. Comey. No. I’m suggesting it was a factor in a decision I made. It was reality, and I stared at that reality and, based on that reality, I made a decision. The decision was, let’s hold onto it until they sort out their leadership.